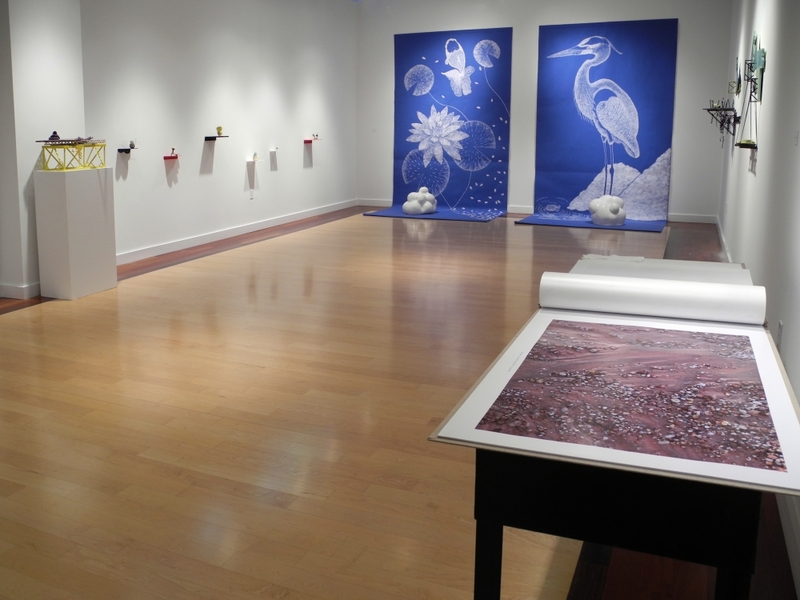 The five artists in “Raising Dust,” at Carroll Square Gallery, all work with earth. Melissa Mytty combines porcelain and plexiglass in fanciful small animal figures, and Matt Ziemke’s constructions suggest industrial landscapes, while adding another mineral to the assortment: salt. Matthew Alden Price constructs wood-and-ceramic wall pieces that also employ acrylic, lacquer and polyurethane; although the format and nature motifs suggest Greco-Roman bas-reliefs, the playfulness is modern. Akemi Maegawa draws on another ancient tradition, depicting flowers, fish and birds on blue-and-white scrolls in an East Asian style; these hangings serve as backdrops for cloud-like forms that are made of ceramic and, thus, undercut the expectation of fluffiness. Margaret Boozer also makes things from soil, but her contribution to this show simply contemplates the stuff. “Dirt Book” is a series of photos that portray — and celebrate — sand, pebbles, dried mud and ice that glazes the earth. These images show earth so rich in patterns and colors that it defies any attempt to exalt it further.